With the heightened awareness around concussions, injuries, and body fatigue, this program will provide more kids with the opportunity to learn the game of football in a safe and secure environment. Today, Under the Lights Youth Flag football announced a partnership with Under Armour, Inc. and DeBartolo Sports and Events to institute a national youth flag football league across the country. Under the Lights is a non-contact league that brings together thousands of participants (K-10th grade) to compete and learn about the game of football. The developmental youth flag football league is currently operating in twenty-five (25) states around the country at over sixty (60) locations. Under the Lights is the most unique youth football league in the country as it promotes a competitive, non-contact football experience for all levels while teaching the latest techniques of contact football. 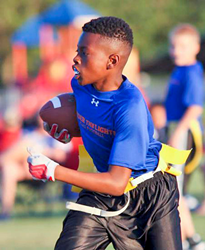 Under the Lights Powered by Under Armour Inc. is a national youth flag football league. Along with youth camps and clinics, the youth flag football league is operated under Brothers in Arms Classic LLC. During the last seven years, youth flag football has grown dramatically in suburban and urban areas. With the continued worry of injury and body fatigue, more parents are utilizing techniques of flag football to prepare for contact. For further information, please visit the Company's website at http://www.uaflag.com. Under Armour, the originator of performance footwear, apparel and equipment, revolutionized how athletes across the world dress. Designed to make all athletes better, the brand's innovative products are sold worldwide to athletes at all levels. The Under Armour Connected Fitness™ platform powers the world's largest digital health and fitness community through a suite of applications: UA Record, MapMyFitness, Endomondo and MyFitnessPal. The Under Armour global headquarters is in Baltimore, Maryland. For further information, please visit the Company's website at http://www.uabiz.com. DeBartolo Sports & Events (DSE) is an events and sports management company specializing in experiential marketing in youth sports. Founded by 2016 Pro Football Hall of Famer Edward DeBartolo, Jr., DSE and its partners work with their relationships to guide, consult and execute sports programs for emerging companies and established brands. In addition, DSE invests in event properties that are aimed at growing youth sport participation through elite training and developmental programs. For further information, please visit the Company's website at http://www.debartolosports.com and http://www.debartolosportsu.com.